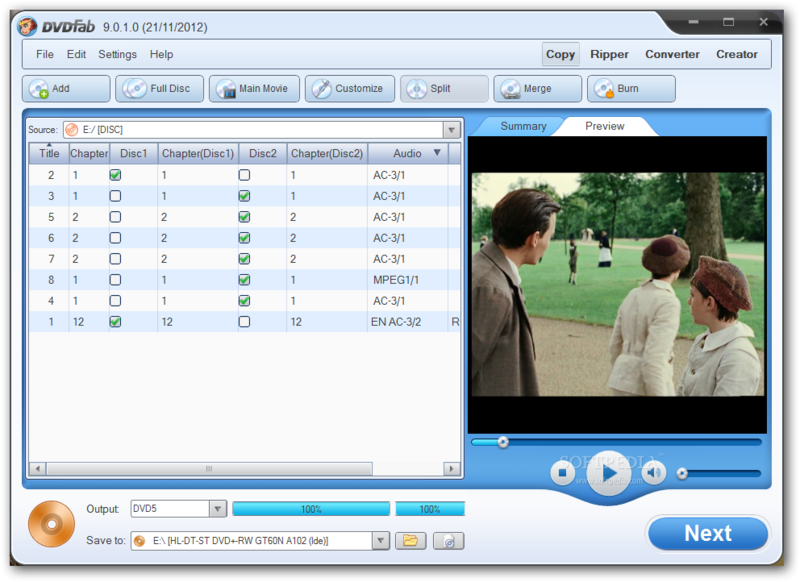 · 8 DVD to DVD copy mode available: Full Disc, Main Movie, Split, Customize, Customize Split, Clone, Merge and Write Data. · Full Disc: All movies, menus and trailers, is copied to a DVD with just one click. · Main Movie: Just copy the movie, with specific audio/subpicture. · Split: Copy a DVD-9 onto two DVD-5 discs with 100% quality, and preserve original menus on both discs. · Ideal for episodic/season DVD movies, TV series, etc. · Customize: Personalize your DVDs! Want to make a DVD with only your favorite titles? How about cutting out those annoying commercials? Or selecting specific audio/subpicture? No problem! You can select just your favorite titles, specify the title playback order, with or without original menus, to create a DVD with only the stuff you want! 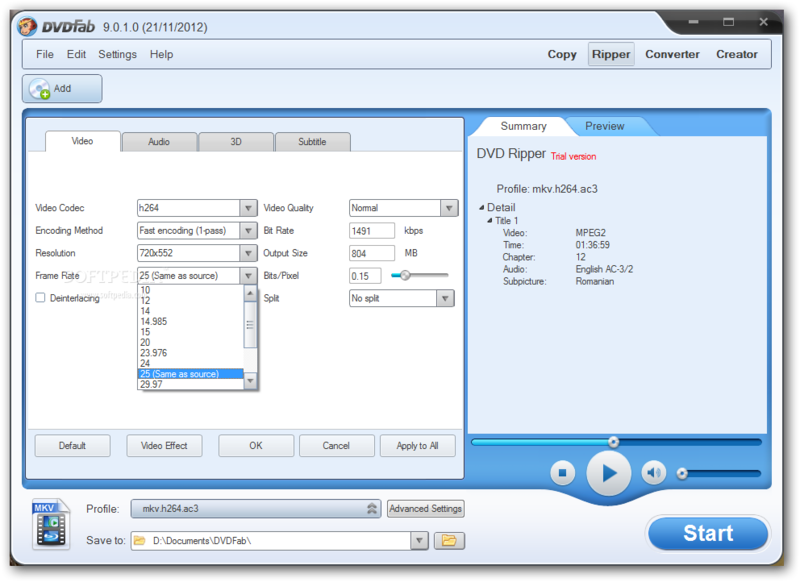 · Customize Split: Copy a DVD-9 onto two DVD-5 discs using "Customize" way. Ideal for episode/season DVD. · Clone: Make perfect 1:1 bit-to-bit copy of DVDs: Make perfect dual layer DVD copy by using the original layer break position. · Copy data DVD disc, like PS2 DVD. · Merge: Combine several titles of several sources into one DVD: Combine two DVD-9 like "The Lord of the Rings" into one DVD-9. · Merge season DVDs to fewer discs. · Create your own special features collection disc. 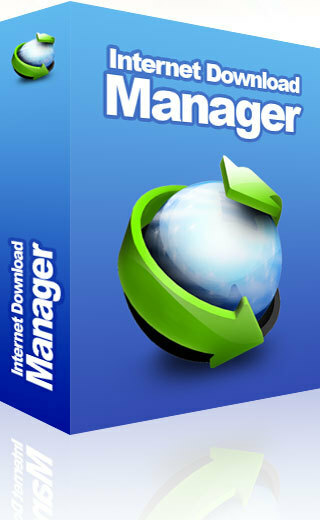 · Write Data: Burn existing DVD folder or ISO image file to DVD writer, or convert DVD folder to ISO image file. · Very fast copying speed, normally it's about 10 - 20 minutes. · Burn to any blank DVD Disc (DVD+R/RW, DVD-R/RW, DVD+R DL, DVD-R DL). · Constantly updated to support latest DVD burners and blank DVD discs. · Remove all DVD copy protections, like CSS, CPPM, RC, RCE, APS, UOPs, ARccOS, RipGuard, FluxDVD, CORE X2, etc. · Constantly updated to support latest DVD copy protections. · Compress DVD-9 to single DVD-5. · Open DVD from disc, ISO image file or folder. · Backup scratched/dirty disc: Even if some information (IFO) cannot be read, you can still copy Main Movie or Customize. · Recovery from DVD reading (VOB) error. · Support both NTSC and PAL DVD. · Preview title like real DVD player. · 10 DVD to Mobile copy mode available: Generic, iPod, PSP, ZUNE, NDS, Xbox 360, PS3, Cell Phone, PVP and PDA. · More devices support can be added manually. · Generic: Convert DVD title to MPEG-4/DivX/XVID/H.264 AVI/MP4 file, which can be played on PC. · It also supports all other devices which are not listed in navigation bar. 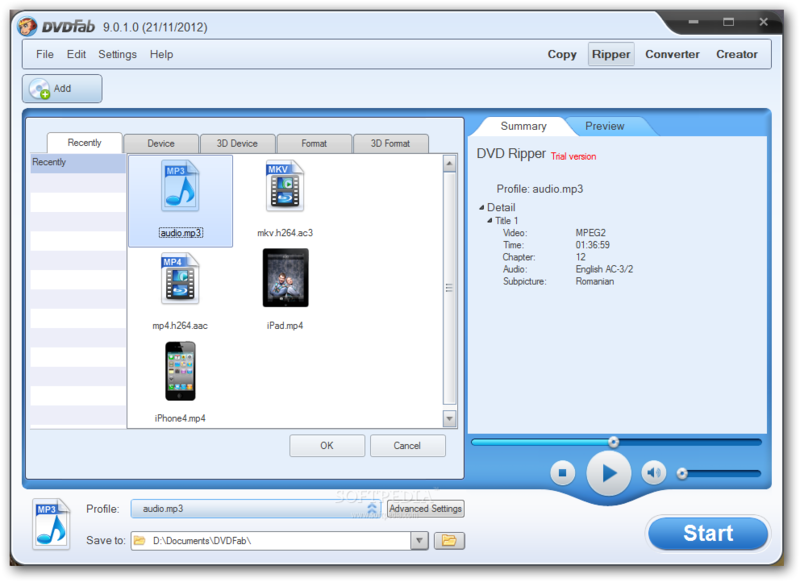 · iPod: Convert DVD title to MPEG-4/H.264 MP4 file, which can be played on Apple iPod. · PSP: Convert DVD title to MPEG-4/H.264 MP4 file, which can be played on Sony PSP. · ZUNE: Convert DVD title to WMV file, which can be played on Microsoft ZUNE. · NDS: Convert DVD title to DPG file, which can be played on Nintendo DS. · Xbox 360: Convert DVD title to WMV file, which can be played on Microsoft Xbox 360. · 8. PS3: Convert DVD title to MPEG-4/H.264 MP4 file, which can be played on Sony Play Station 3. · Convert DVD title to specific format which is supported by Cell Phone, PVP (Portable Video Player) and PDA (Personal Digital Assistant). · Constantly updated to support more mobile devices. · Crop automatically to remove the black bar on many widescreen movies. · Allow user to resize output from letterbox to pan&scan. · Very fast conversion speed, fully optimized for multi-core system. · Support both NTSC and PAL video format. 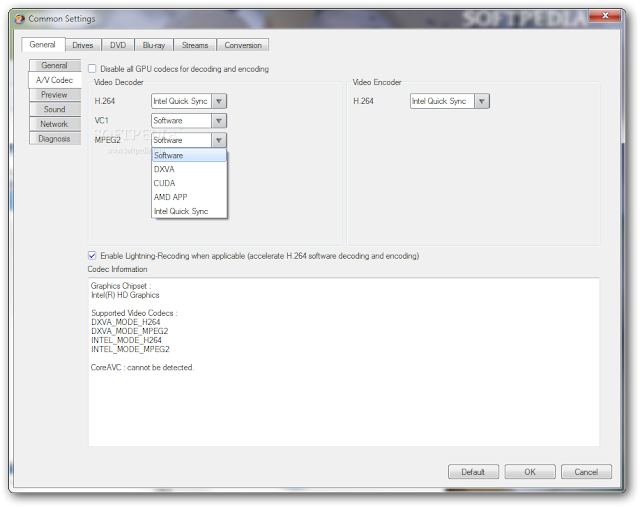 · Extract DVD audio to MP3/MP4/WMA/WAV/AC3/DTS with "Audio Only" output type. · Support up to 5.1 multichannel audio output. · 4 Blu-ray to Blu-ray copy modes available: Full Disc, Main Movie, Clone and Write Data. · Full Disc: All movies, menus and trailers, is copied to a Blu-ray with just one click. · Clone: Make perfect 1:1 bit-to-bit copy of Blu-ray. · Write Data: Burn existing Blu-ray folder or ISO image file to Blu-ray writer, or convert Blu-ray folder to ISO image file. · Very fast copying speed. · Burn to any blank Blu-ray Disc (BD-R 25, BD-RE 25, BD-R 50, BD-RE 50). · Constantly updated to support latest Blu-ray burners and blank Blu-ray discs. · Remove all known AACS copy protection. · Remove all known BD+ copy protection. · Remove Region Code, BD-Live and UOPs. · Constantly updated to support latest Blu-ray copy protections. · Compress BD-50 to single BD-25, BD-9 or BD-5, in "Full Disc" or "Main Movie" mode. · Burn to cheap blank DVD Disc (BD-9 and BD-5). · Remove HD audio (convert Dolby TrueHD to Dolby AC3, convert DTS-HD Master Audio to DTS) to save space for video when compression is needed. · Include internal UDF 2.50 parser to read Blu-ray, no need to install third party driver. · Open Blu-ray from disc, ISO image file or folder. · Support both NTSC and PAL Blu-ray. · Preview title like real Blu-ray player. · 6 Blu-ray to Mobile copy mode available: Xbox 360, PS3, to MKV, to AVI, to MP4 and Audio. · Xbox 360: Convert Blu-ray title to MP4 file, which can be played on Microsoft Xbox 360. · PS3: Convert Blu-ray title to MPEG-4/H.264 MP4 file, which can be played on Sony Play Station 3. · Convert Blu-ray title to MKV/AVI/MP4 file. · Convert Blu-ray audio to MP3/MP4/WMA/WAV/AC3/DTS. · Support up to 7.1 multichannel audio output. · Read most popular video formats from Internet, digital camcorders, capture cards, etc. No external codecs needed. · MP4 File ( .mp4; .m4v ), MPEG File ( .mpeg; .mpg; .dat ), MKV File ( .mkv ), RMVB File ( .rmvb; .rm ), TS File ( .ts ), VOB File ( .vob ), WMV File ( .wmv ). · 10 "File to Mobile" conversion mode available: Generic, iPod, PSP, ZUNE, NDS, Xbox 360, PS3, Cell Phone, PVP and PDA. More devices support can be added manually. 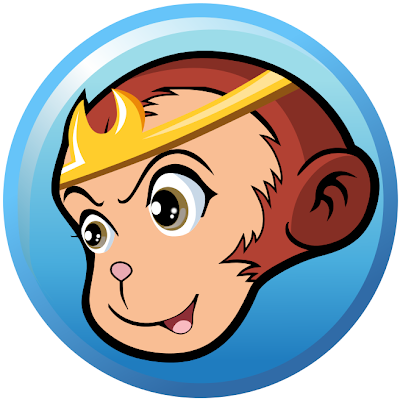 · Generic: Convert video file to MPEG-4/DivX/XVID/H.264 AVI/MP4 file, which can be played on PC. It also supports other devices which are not listed in navigation bar. · iPod: Convert video file to MPEG-4/H.264 MP4 file, which can be played on Apple iPod. · PSP: Convert video file to MPEG-4/H.264 MP4 file, which can be played on Sony PSP. · ZUNE: Convert video file to WMV file, which can be played on Microsoft ZUNE. · NDS: Convert video file to DPG file, which can be played on Nintendo DS. · Xbox 360: Convert video file to WMV file, which can be played on Microsoft Xbox 360. · PS3: Convert video file to MPEG-4/H.264 MP4 file, which can be played on Sony Play Station 3. · Convert video file to specific format which is supported by Cell Phone, PVP (Portable Video Player) and PDA (Personal Digital Assistant). · 6 "File to File" conversion mode available: to AVI, to MP4, to WMV, to MKV, to FLV and to 3GP. · Convert video file to MPEG-4/DivX/XVID/H.264 AVI/MP4/MKV file, or WMV/FLV/3GP file. · Support full high definition video up to 1080p. 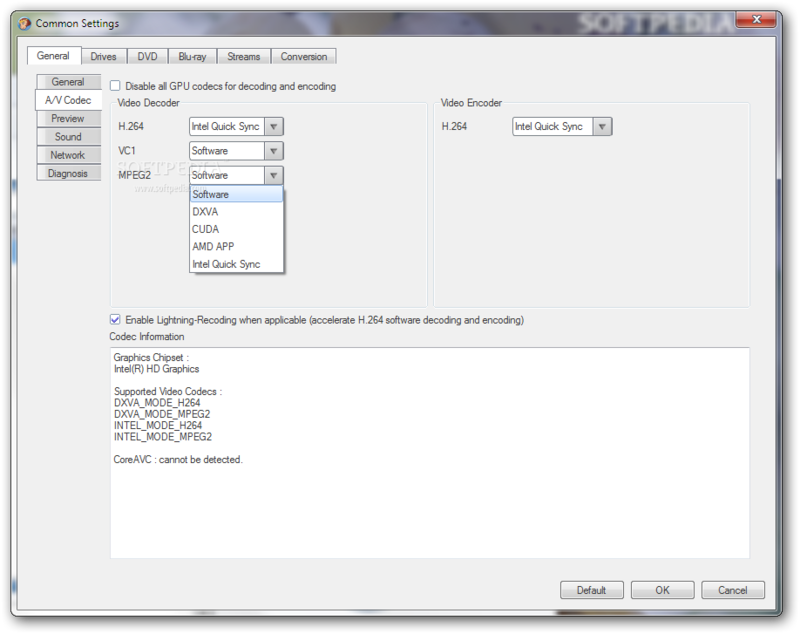 · Support external subtitle file, and render to video directly. · Preview video file like real player. · Extract audio to MP3/MP4/WMA/WAV/AC3/DTS with "Audio Only" output type. · Transfer converted files to devices. Currently it supports iPod, PSP and ZUNE, and it will support more devices in the future.